One of the most well-known winter squashes, pumpkins can be used in a variety of different ways- whether you’re in the kitchen making something sweet or savory, it can also be used for decoration. Pumpkins can be stored in cool dark places for months a time. 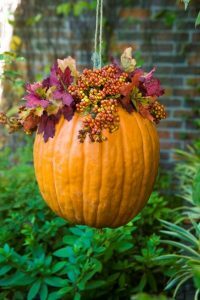 Plant pumpkins and other winter squashes after the last frost in the spring, when the soil is about 70 degrees or more, and harvest in the fall before the first frost. Make sure when planting pumpkins, plant them near the edges of the garden to keep them from taking over your entire garden.